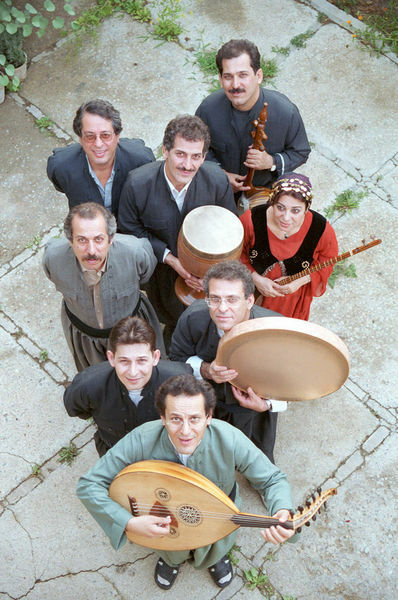 The Kamkars (or Kamkaran in Kurdish) are one of the leading musical ensembles in Iran today. They are made up of a long-established musical family of seven brothers and a sister, who originate from the city of Sanandaj. The Kamkars Music Band was primarily established in Sanandaj in 1965 as a family band headed by Master Hassan Kamkar (violinist) and comprised of Houshang (accordionist), Bijan (singer), Pashang (dulcimer), Ghashang (violinist and singer) and Arzhang (drum) and performed in various events at the officers club, schools and performance halls of the city of Sanandaj. The Kamkars at first did their musical practices around the small pond of their house at night. The music band was further completed gradually upon growing up of the children and became more consistent in terms of assembling. It performed concerts formally in certain cities of Kordestan as well as the city of Orumiyeh (East Azarbaijan province) with its members namely, Houshang (violinist), Bijan (Tar player and singer), Pashang (dulcimer), Ghashang (singer), Arzhang (drum) Arsalan (lute) and Ardeshir [Kamancheh (a violin-like Persian instrument with a small belly)]. After 1971 certain members of the family including Houshang, Bijan, Pashang and Arsalan went to Tehran to study academic music and were admitted in the Faculty of Fine Arts (Arzhang was then studying painting). The Kamkars established the Sheida and Aref Bands together with Mohammad Reza Lotfi, Hossein Alizadeh, Parviz Meshkatian and a group of other musicians. The two bands presented successful concerts with Mohammad Reza Shajarian and Shahram Nazeri as singers, thus creating pieces which would undoubtedly be remembered as memorial works of the traditional Persian music. The first formal concert of the family under the name of "The Kamkars" was performed on the early days after the revolution at the Azadi Complex and the Vahdat Hall which consisted of three parts: Persian music, dulcimer solo by Ardavan and Kordish music. In 1989 Omid Lotfi, son of Ghashang and Mohammad Reza Lotfi joined the band as a tar player. In their recent concerts, the Kamkars have also included certain younger talents in their band. The band performed in many concerts inside and outside Iran and had a powerful and admirable presence in most of the major music festivals of the world such as WOMAD, organized by Peter Gabriel, Summer Stage (New York) and many important great music halls of Europe and the United States. The Kamkars have also held many concerts in most of the Kurdish cities of Iraq, and in 2001, for the first time in the history of Turkey, they performed Kurdish music in the cities of Istanbul and Diarbekr which are considered as a turning point in the musical events of the region. Among other major works of the Kamkars is participation in the music festival of Luciano Berio, the famous and modern Italian composer. The concerts which were held in many British cities in 2004 was a joint performance by the Kamkars and symphonic orchestra of London, thus representing a harmony of two types of Kordish music and the modern music of the world, which drew attention of many musical scholars and fans. Performance of Kamancheh concertino with symphonic orchestra of Malmo in Sweden in 2005 serves as another example of the success of the band in recent years. In addition to the public performance, the Kamkars have produced various albums including Uraman, Autumn yellow, Shilereh, Gelavizh, the Kamkars, Agrizindo, Golnishan, Parshang, Kanisepi, songs of percussions (for percussion instruments), trio and solo, In memory of Saba, Everad, and Imsho. Moreover, each member of the Kamkars has also presented various works in the form of album, music tracks of movies, and authoring and translating books which will be mentioned in their biographies separately. The band invited other masters of music in Iran in 1997 to found Kamkars Open Music Institute in Tehran, which is presently active and has played a considerable role in introducing talented and new figures to the art community of Iran.